Extensive rolling parkland and gardens surround this beautiful stately house. Run by the National Trust. Large formal garden with clipped box hedges and whimsical topiary. Water gardens with a pagoda overlooking a large lake, fringed by flowering cherry and maples. Near to the house are many interesting garden ornaments, statues, urns and ornate garden buildings. 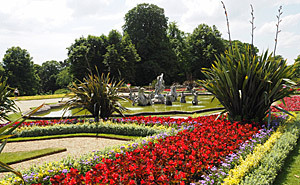 Magnificent landscaped park developed in the 17/18th centuries for the Dukes of Buckinghamshire. 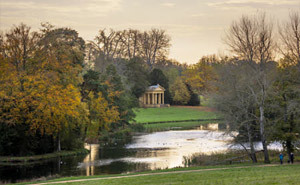 One of the most ambitious and important landscape gardens in England. It is packed with Greek and Gothic temples, grottoes, statues, ornamental bridges, artificial lakes and natural planting. 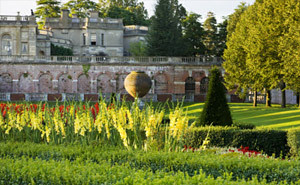 Added to by many of Britain's leading garden designers during its 300 year history. Waddesdon's renowned parterre begins to come into flower in March, with spring bedding of tulips, primulas, scillas and early daffodils. In summer the terraced gardens are a riot of colour with traditional Edwardian style bedding schemes. Also a superb Aviary Garden featuring delicate wrought iron work, plus an orchard with wide variety of apples and other autumn fruits.